When we put on our foundation, it makes our face even-toned. It means, our natural face contours are not visible, making our face appear rounder, flat and sometimes feature-less in pictures. Thus, we try to develop all our features again using contour and highlight technique, after doing our foundation, so our face looks natural and not feature-less. That is basically what contouring and highlighting your face is. 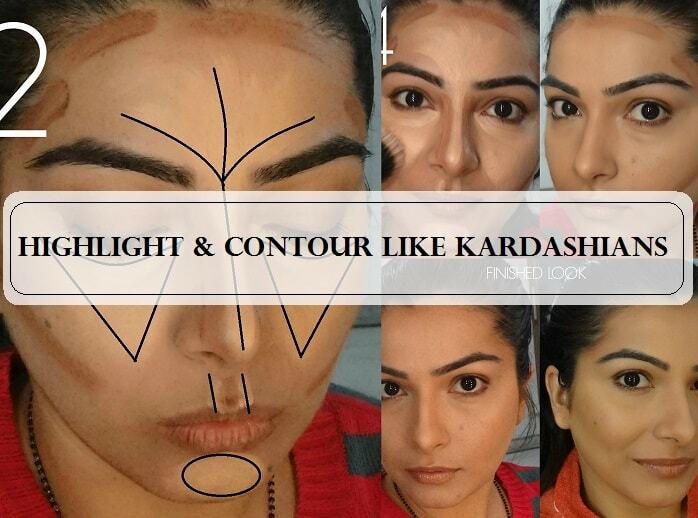 You must have seen makeup tutorials on instagram and everyone in Kardashian clan from Kim to Kylie advocating how important contouring is. 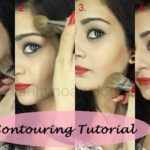 I will share my own technique on how to contour and highlight to look thinner in a few steps. 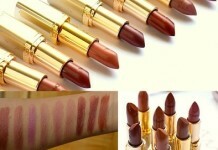 I am new at VNA but certainly not new to the makeup industry. Let me introduce myself first, so you all could understand me better. 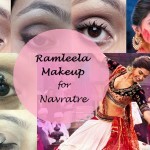 I am Meher Chawla, a professional makeup artist. 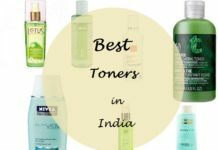 I have sensitive skin type, means my skin has a mind of its own. I am somewhere between heart-shaped and diamond face shape, fair skinned, like NC35 in Mac. 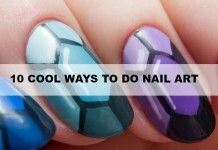 I think that covers it all, so let’s begin with the tutorial. 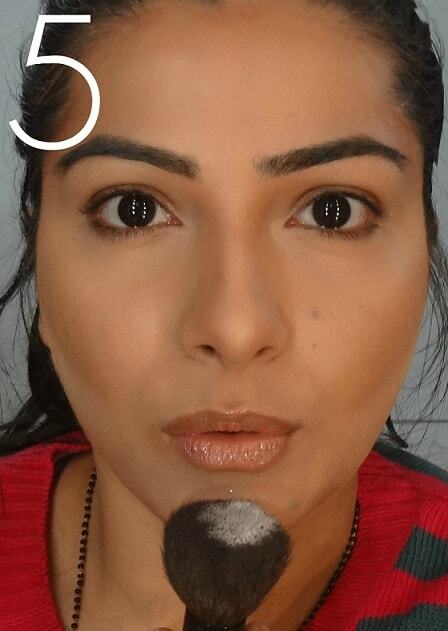 What is Contouring in makeup? 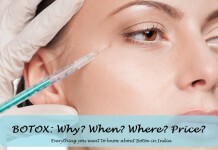 What is Highlighting in makeup? 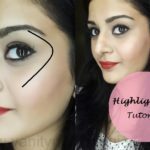 Highlighting is brightening (the area you want to bring out, for example, we always highlight the brow bone area, whatever the age, makeup or face shape it may be). 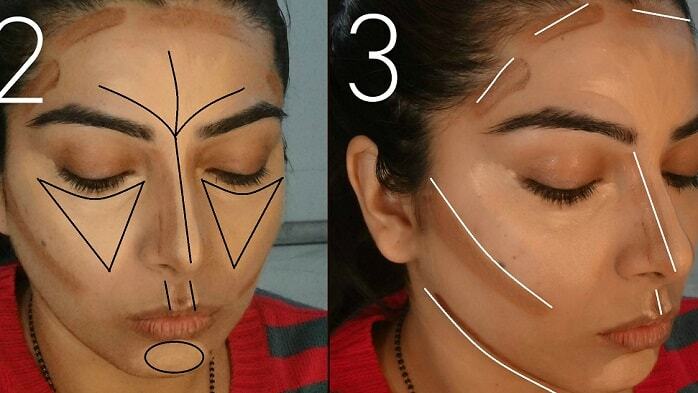 Why to Contour and Highlight your face? 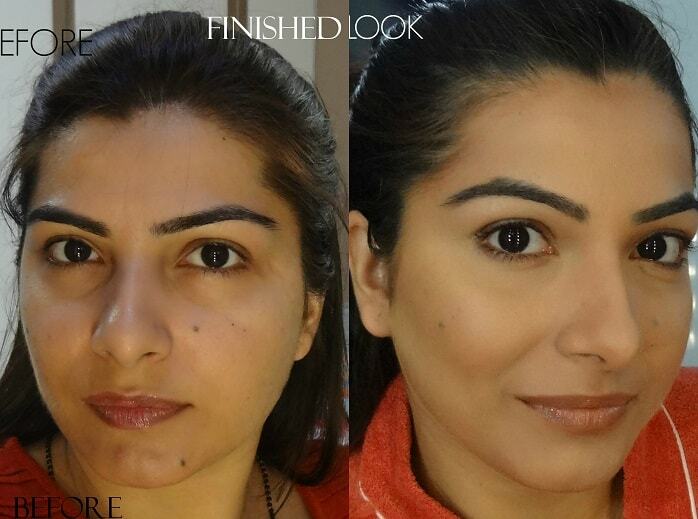 Our purpose for face contouring is to create an illusion of perfect face shape and features; and who doesn’t want that? 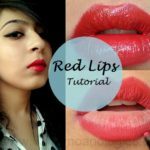 This technique helps those who want to make their face and features appear slimmer or broader, sharper, model-like.. Heck, we can look like into someone else with this technique too, if you are a master in it that is! Now the products I am going to use for this is the kryolan’s supra colour palette, but if you don’t have it, don’t fret and use one shade lighter and two shades darker (from your actual tone) of either of the these: Foundations, Compacts, Eyeshadows or contour powders, Concealers. Step 1: First prep your face by cleaning and moisturising. 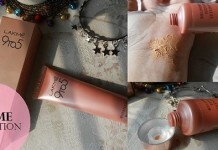 Then apply a suitable face primer and your true tone foundation then proceed towards highlight and contour. 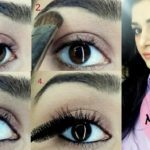 Load your brush with the lighter colour and starting from your tear duct create a triangular shape below your eyes, a straight line on your nose, a fountain on your forehead and oval on your chin. Also if you like parallel lines, under your nose, like in the picture. Here we are trying to bring out the features that are higher, that catches light. 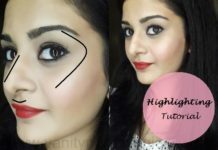 Now clean your brush a little and load it with the darker colour and very carefully now, create an angular line starting from the top of your ear towards the corner of your lip but finish it an inch before the corner of your lip.Using a thinner brush draw very lightly, parallel lines on either side of your nose highlight, also a border line just below your jawline and a line below your nose like in the picture. Here we are receding the parts of our face which are supposed to be shadowed or somewhat receded, the parts that generally does not catch light in a perfect face shape. That’s it! Your finished painting!! I can’t recall a better word for this. Now you just have to blend it all. The key is to blend it nicely so the different shapes we’ve just created aren’t so obvious and look like the part of your face. 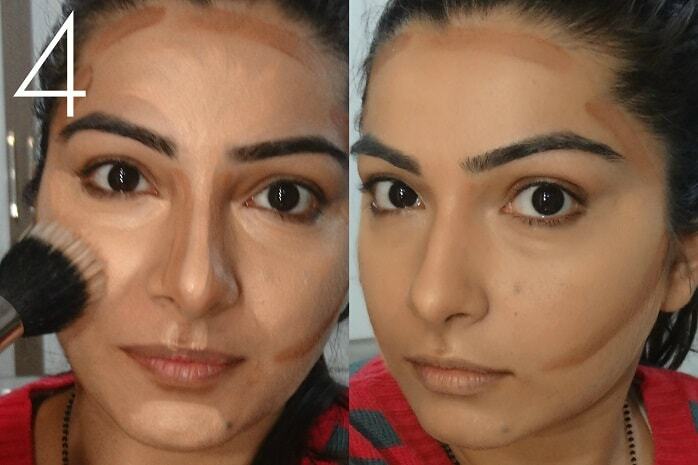 So ladies, take your time and blend all the foundation or concealer in. 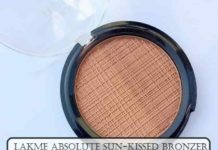 First blend the lighter colour highlighter (whether you have used a foundation or concealer) by retracing the shape with your brush over and over again and then the darker colour. Try not to mix both the colours except where the actual merging is happening. Set your masterpiece with the translucent powder or, if you have, similar shades of contour powders. 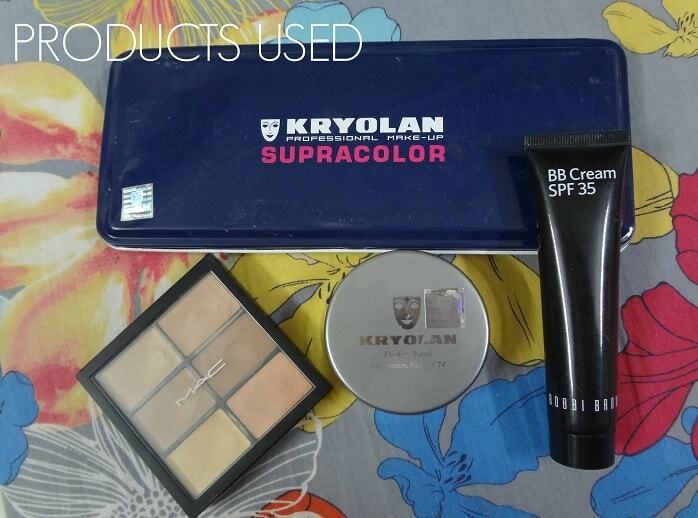 I am using Kryolan’s translucent powder here. 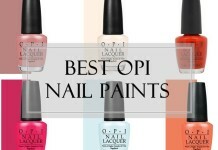 Ofcourse you’ll have to skip this step if you’ve done it all with the powders. And you are done! Well for all those who’ve got it right, I’m super proud!! And those who haven’t, don’t worry, practise makes perfect! But whatever the case please do comment below to tell me how it all went. You can see my before and after photo and see how a little contouring and highlighting can bring a difference in your face shape and contours. How do you contour and highlight your face? Share your reviews with us. My God… You look stunning post the contouring & highlighting.. Such a detailed tutorial.. I really love my pictures when I have contoured my face.. Thank u @crazyforcosmetics, I’m sure you must have looked gorgeous! 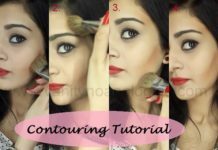 Contouring is quite helpful in attaining sculpted look… since I have started doing it I never leave it even for a regular day time look. 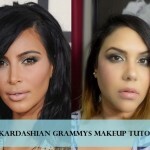 great tutorial.. what shades have you used for highlighting and contouring in kryolan?